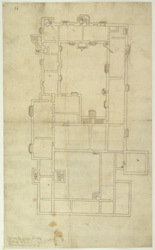 This is a plan by John Rogers of proposed alterations to a manor house in Hull that Henry VIII acquired in 1539. Rogers, a master mason employed by the king as a military engineer for work on Hull’s defences, had also to make alterations to the house to adapt it for defence and also as a Royal residence. Although not specifically stated the plan is actually drawn on a scale of 1 inch to 16 feet. In this respect it is remarkable as it one of a series of three maps of this house which are the earliest known plans of civil buildings in England to be drawn to scale.